My husband loves this cake. He is a fan of sweet (check). He loves citrus (check). He loves moist (check). And he prefers his desserts cold (check). So I think it’s safe to say that this is a popular dessert in our house. (I think it’s pretty tasty, too!) And it’s really easy to make, so it’s not something I mind making. And since it’s made in a 9×13 inch pan, it’s great for showing some kindness through sharing! Make the Orange Cake according to the box directions. While the cake is still warm, poke holes in the cake with the end of a wooden spoon or a skewer. Mix the box of orange jello with the boiling water. When it’s thoroughly mixed, pour it over the cake. Refrigerate the cake while you prepare the topping. In a bowl, mix the vanilla pudding with the cold milk. Then fold in the cool whip. When the cake is cool, spread the topping on the cake. Refrigerate the whole cake until you are ready to enjoy. It is soooo delicious. You will not be disappointed! I add cream cheese to the pudding and cool whip with some crushed pineapple. I tried your variation cause I love pineapple, it was terrific! Thanks so much for that idea!!! Everyone exchange over it. I only got one small piece, so I’ll have to make one just for me!! What size jello and pudding mix? Also did you use instant pudding?? Use the standard size jello and pudding mixes, 3 oz box for the jello and 3.5 oz box for the pudding. And yes, it is the instant kind. Hope you enjoy! See the above reply for the sizes. I haven't made it with sugar free mixes, but I'm pretty sure that it would turn out just as delicious. Let me know if you do! DO YOU NEED TO COOL THE CAKE TO ROOM TEMP WITH THE JELLO IN IT BEFORE PUTTING IT IN THE FRIDGE ? You can pop it in the fridge right away. That's what I like about this cake. No fuss. Enjoy! I wonder if this would turn out OK with lemon flavor. I have never seen orange flavored cake mix…where do you get that? I got it at my local grocery store without any trouble. I would just scan the cake mix aisle. It could be you've never seen it because you've never looked for it before. But if you can't find it, I'm sure a lemon or vanilla cake would still work wonderfully with orange jello in this cake. Good luck! Walmart, Duncan Hines has orange flavored cake mix. Do I make the jello according to the box or only with the cup of boiling water? The box calls for a cup of boiling water and a cup of cold. Use only the one cup of boiling water. You want a more concentrated jello flavor for this cake. Hope you enjoy it! 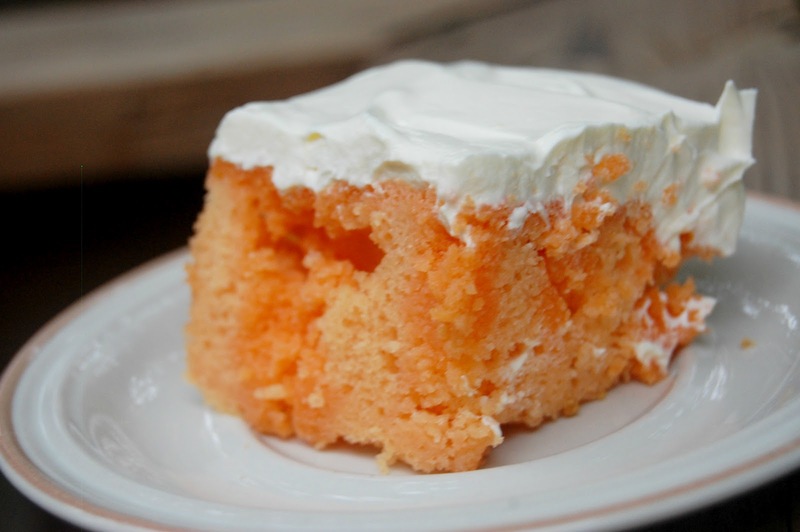 Where can you buy Orange Cake mIx, and what brand is it? Not sure it is avaiable in Canada. I bought my cake mix at my regular grocery store. It was a Duncan Hines Orange Cake Mix. I looked for it on Amazon, and it's there, but the price is crazy! I bought mine for 1 or 2 bucks at the store. In my experience, only Duncan Hines carries an orange flavor. But this cake would be still good with a vanilla cake as the base. Or you can change the flavor completely and make a strawberry version. Hope you find it! Love it!!! First attempt using this recipe, came out PERFECT! My Aunt always made this cake when I was little, tasted just like hers! Thank you!!! Do I make the vanilla pudding or just put the powder and mix with the milk? Just go ahead and mix one cup of milk with your vanilla pudding powder. Do you use a small box of jello and pudding mix or the large box? I didn’t see the amount any where. Yes, you use the small boxes for both the jello and the pudding. Hope you enjoy it! I used a yellow cake mix but added a cup of orange juice in place of the cup of water it called for in the directions. The dessert was fabulous! Thank you for the recipe. I’ve made this using a lemon cake mix and the lime jello. For the icing, my recipe called for 1 envelope of Dream Whip mixed per directions on the box, add in 1 small box lemon instant pudding, 1 1/2 cups cold milk in a chilled mixing bowl. Serve with rainbow sherbet. Really great on a hot, summer day! Mix Dream Whip, instant lemon pudding and 1 1/2 cups milk all together in a chilled mixing bowl and best 3-5 minutes and frost cake immediately. It’s been a while since I’ve made it and memory isn’t as sharp as it used to be so I checked my recipe. I apologize for my error. I just made this, oh it’s sooooo good. I found a few different recipes on this, but this one was so much easier to follow. The only thing, I used the orange cake with the orange jello, I wish it had more orange, so next time I’m going to put orange extract in the cake mix. I’m not sure about everyone else but I find the orange cake mix has a very fake orange bitter taste. So I’m gonna use the French vanilla cake mix. And I have also seen recipes that use orange juice orange soda. I may add some OJ bit can’t wait to make this cake. Any tips are appreciated and I’m wondering if I’m the only person who found the orange cake mix had a weird taste lol. Had anyone used the 6oz package of jello vs the 3oz? So sorry I don’t have an answer for that one! Previous story Play: Orange you Glad I Didn’t Say Banana? !